I know, I know. It seems like it might cost a lot. Plus, they’ll just dry up and start to droop after a few days. And she already knows you love her, so why must you prove it again and again? Because Valentine’s Day is coming, bud. And since you didn’t get on the stick and plan or buy anything awesome well in advance, you’re going to have to pull the trigger on the single most reliable, targeted, dopamine-generating weapon left in your dwindling arsenal of romantic gestures. You’re going to give her a dozen red roses. Stick close to me. I’ve been doing this a long time. And believe me, nothing says “Be Mine” like a colorful, sweet-scented gift that seems to make absolutely no sense and will definitely be dead in a week. But bear with me here: There’s an excellent chance you’ll come out smelling like – well, like a rose – if you just follow my time-tested, guaranteed-to-please Valentine’s Day rules. unless you’re that rare dude bent on outdoing Marc Antony, who filled an entire room knee-deep in rose petals to woo Cleopatra. A dozen red roses had better be red. Yes, pink roses look soft and dainty, and those peach-colored ones do have a certain flair. But like rose numbers, rose colors have particular meanings – friendship, respect, admiration, and gratitude, to name just a few. So don’t go thinkin’ or try getting creative. Even though she’s now the mother of your children and your days of wild abandon have long gone the way of mortgages and minivans, she’s the exact opposite of a hulking, snorting bull in the ring when it comes to how her brain is wired for flora: Any rose other than red, the color that certifies your unwavering and eternal love, will only arouse her fury and cause her to charge. A dozen red roses doesn’t have to break the bank. I learned long ago that there is no correlation between the cost of roses and the length of time they stay fresh. So forget the expensive florist and buy the cheapest ones you can find. You can get by with the bunches you see at the pharmacy, in the grocery store, and sold on the ramp next to the highway by that lady with the hand-painted sign who looks like Bloody Mary from South Pacific. Also, be sure to add some baby’s breath. What is it? Just filler stuff that makes the bouquet look bigger. Science still can’t tell us why, but this foliage has long been known to delight the feminine heart, and your true love will give you special bonus points for including it. 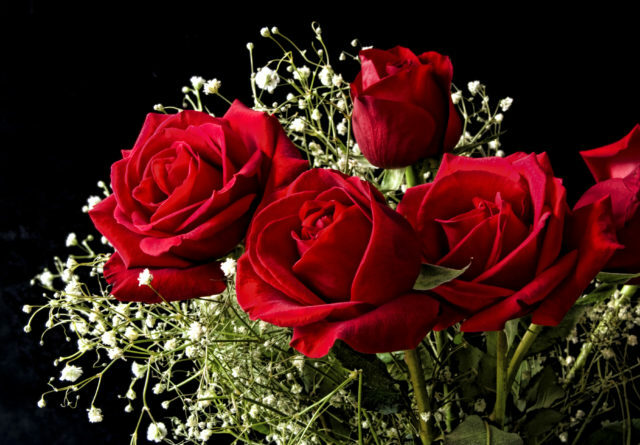 A dozen red roses must be delivered in person. Now that you’ve cut the ends off the stems, arranged them in the vase, and added a bit of that plant food that came stuck to the plastic wrapper, it’s up to you to deliver the roses to your sweetheart. Trust me. This is a good thing. It’s your chance to get the Valentine’s Day credit you so richly deserve. First, make a card that prominently features both her name and your name and tape it firmly to one of the rose stems. This way, everyone who sees the bouquet will know you sent it. Now throw on some nice clothes and drive to her workplace. Let the folks up front know that you’d like to deliver the flowers in person, and once you’re past the desk, wander the building or grounds aimlessly for a while. Walk down the wrong hallways. Get off the elevator on the wrong floor. Of course you know where she sits. Just act as if you don’t. This way, everyone she works with sees you carrying her bouquet looking lost, clueless, and adorable. After schmoozing and delaying for as long as you can, you finally arrive at her door. She’s away from her desk? Even better. Leave the roses with the office manager. This way, until the love of your life returns from her meeting or lunch or wherever, the roses will sit on a counter in the middle of the office, letting everyone who has the chance to pass by marvel at your incredible thoughtfulness. So give yourself a pat on the back. You did a good thing. You got yourself through another Valentine’s Day. And the best part of all? You managed to make it all about you. Previous articleScience is Fun – and Bouncy!